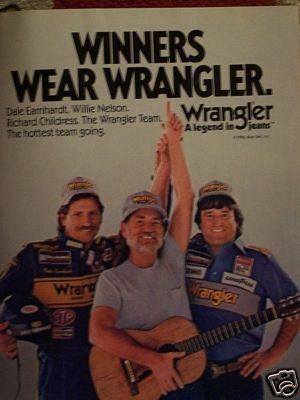 Car owner Richard Childress and his then-driver, Dale Earnhardt, participated in an advertising campaign back promoting Wrangler jeans back in the 1980s that also featured country-music star Willie Nelson. Now, more than 30 years later, Childress can tell why he thinks Nelson was smiling so mightily in the ad. “I came in from hunting in British Columbia and Dale and I ate at one of those really neat seafood restaurants there,” Childress said Wednesday during a promotional event at Wrangler corporate headquarters. “We got up early the next morning for the photo shoot. Dale and I were sitting there waiting. I was expecting Willie to come out with a cowboy hat and everything.”hat isn’t what happened. And although Childress admitted perhaps he should not have been surprised, what happened next also caught him off-guard. “He came out with a baseball hat on and wearing a black Member’s Only jacket. That was his disguise back in the day,” Childress said. “So he jumps in the limo and we shake hands. That was the first time I had met him. I’m not sure if it was for Dale. Dale Earnhardt Jr. was just a kid at the time and had no idea any of that was going on. Apparently, Willie was pretty giddy at the time, too. This entry was posted on Thursday, October 20th, 2016 at 9:28 am and is filed under Advertisements, Commercials. You can follow any responses to this entry through the RSS 2.0 feed. You can leave a response, or trackback from your own site.